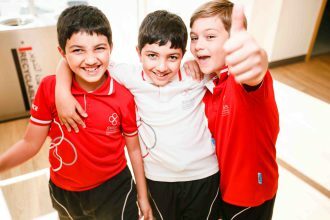 At Swiss International School Dubai, we believe that being “international” means opening one’s mind to other cultures and different ways of thinking. We are living in a world where English looks set to remain the lingua franca, but where being able to speak, read and write in only one language is no longer enough. In response, we have created a unique environment where children from all over the world can live and thrive in a multilingual and multicultural environment. Our students are uniquely privileged to be learning the skills and aptitudes required to prosper in a perpetually changing world, as a fundamental part of their education. SISD is first and foremost an international community where students, teachers and staff from all over the world work, live and prosper together. Well over 60 nationalities are represented on campus, which creates an exceptional mix of languages, cultures and ethnic backgrounds. Our approach to learning encourages creativity, problem-solving and good decision-making. In this article, we aim to summarize what makes bilingualism so appealing, and how can it be managed and cultivated at home for an optimal experience for your child. Bilingualism confers a variety of proven benefits for children. In previous blog posts, we’ve noted that bilingual students have improved executive function, better working memory and cognitive flexibility, and even perform better in school. They’re also more adaptable, and are thought to be better at problem-solving. One popular myth about raising a bilingual child is that exposing children to more than one language will result in developmental delays or speech disorders. This idea is not supported by the research, and we find that many countries – indeed, more than half the world population – already raise their children in bilingual or even multilingual environments. We find nothing but benefits to building a bilingual learning environment for children. To get the most out of bilingualism at home, here are some top tips for parents. Both parents may or may not be necessarily fluent in their child’s second language, but it’s important for the child to receive as much exposure as possible to help immerse them in the learning experience. Watch movies or TV in the second language, and keep literature such as books and magazines around the house which is written in that language. If you’re helping your child learn a language at home, correct them without making it too oppressive, lest they become afraid to speak the language. Don’t outright call them out for being wrong, but rather rephrase what they say in the correct way, to help them recognize their mistakes. While your child might be already taking language classes at school, it’s also important to have goals for their functional literacy. Whether you want your child to be able to speak fluently, or to be able to read and write at the level of a native speaker, or just would like for them to be able to ask for directions in a foreign country, ensure that you work alongside your child and cooperate in your efforts towards these specific goals. Everyone adopts languages at different rates, and it may be difficult if you feel that your child doesn’t seem to be getting it at the pace you’d like. But like all things, it’s a gradual process that requires exposure, effort, and motivation on both the parts of the parents and the child. Stay the course – the benefits will be undeniable. Learning anything is best when it’s engaging, fun, and doesn’t feel like work. Don’t just make it a question of textbooks and tests, but also try to bring in reading for fun, playing games, or solving puzzles and riddles in the second language. Watch our Grade 8F1 Students explain these french expressions.